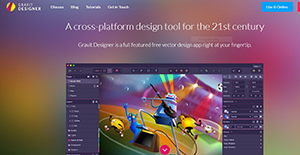 Gravit designer is a full-featured, vector graphics design solution for product designers, graphic designers, and web designers. The program provides a set of powerful tools that help the user to unleash true creativity in designing beautiful and detailed vector imagery. The tools include structure, vector, layout, precision, style, text, text, and many more. With tools such as UI design, icons, graphics for marketing tools, creating cool concept art, animation, or presentation, Gravit Designer is for sure capable to revolutionize the way you work. Besides, this cross-platform application is completely free to use. It can run as an in-browser or a desktop application and operates smoothly on Windows, Chrome OS, Linux, and Mac devices. Although Gravit Designer is completely free, it provides set of tools and features that can rival its sophisticated counterparts. One of these noteworthy features is the SVG editing tool designed to deliver unmatched precision. A knife is available as well, and the tool supports nondestructive Boolean that makes it ideal for UI design. The advanced and welcoming dashboard gives you an option to set your preferred document height and width. There is also an option to leave these fields empty, thereby creating an infinite canvas ideal when unsure of the dimension of your design. In addition, the welcome screen provides a host of predefined dimensions. There are 19 presets dimensions for print, 15 for social media content and cover, 8 for web design, 7 for tablets, and 6 for watches and phones. Everything is easily accessible making the platform an excellent option for beginners. Additionally, the program has a clean and intuitive interface that is highly customizable. Even when exploring the software for the first time, it is difficult to get lost. The interface allows you to open multiple documents and easily access them via the visible tabs on the top right corner. On the left-hand side, the UI has three tabs libraries, layers, and tutorials. The tutorial tab is a great source of guidance when you are getting started with the platform. The layers tab displays your list of open pages and layers. Whereas, the libraries tab offer an extensive set of drag and drop tools. If you are interested in Gravit Designer it might also be beneficial to analyze other subcategories of Best Graphic Design Software collected in our database of B2B software reviews. There are well-liked and widely used systems in each software category. But are they necessarily the best fit for your company’s specific needs? A trendy software product may have thousands of users, but does it offer what you require? For this reason, do not blindly shell out for popular systems. Read at least a few Gravit Designer reviews and mull over the aspects that you wish to have in the software such as the cost, main functionality, available integrations etc. Then, choose a few systems that fit your requirements. Try out the free trials of these products, read online opinions, get information from the seller, and do your research thoroughly. This profound groundwork is certain to help you choose the finest software solution for your firm’s special needs. How Much Does Gravit Designer Cost? We realize that when you make a decision to buy Graphic Design Software it’s important not only to see how experts evaluate it in their reviews, but also to find out if the real people and companies that buy it are actually satisfied with the product. That’s why we’ve created our behavior-based Customer Satisfaction Algorithm™ that gathers customer reviews, comments and Gravit Designer reviews across a wide range of social media sites. The data is then presented in an easy to digest form showing how many people had positive and negative experience with Gravit Designer. With that information at hand you should be equipped to make an informed buying decision that you won’t regret. What are Gravit Designer pricing details? What integrations are available for Gravit Designer? If you need more information about Gravit Designer or you simply have a question let us know what you need and we’ll forward your request directly to the vendor.